Varza à la Cluj is a special type of food specific to Transylvania, almost as popular as the "sarmale" that's made up of minced meat and rice in a pan and then baked in the oven. Spread a little bit of grease on a saucepan walls and then stretch one layer of sauerkraut, 1 layer of meat and 1 of sour cream. Spread the rice and some salt and black pepper between the cabbage and the meat layers. 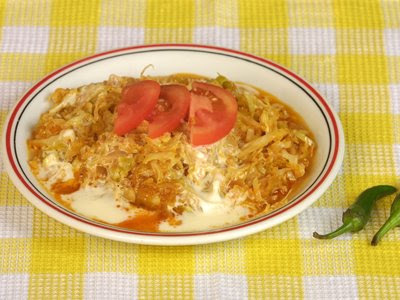 Repeat this until all the ingredients are over and make sure you put a last layer of sour cream on top of everything. Put everything in the oven (190 ° C ) for about 30 – 35 min.